Posted Aug 02, 2018 by Eds. Tatour, a Palestinian citizen of Israel from the Galilee, was convicted of three counts of incitement and supporting a terrorist organization last May after a lengthy trial. Prior to sentencing, Tatour had spent nearly three years under house arrest, during which she was banned from publishing and accessing the internet. During the hearing prosecutors focused on a video posted to social media of Tatour reciting an original poem titled “Resist, my people resist them,” against backdrop images of violent confrontations between Palestinian and Israeli armed forces. Cast them aside for a coming time./Resist, my people, resist them./Resist the settler’s robbery/And follow the caravan of martyrs. Tatour was arrested by Israeli police in October 2015, a time when small-scale attacks, particularly stabbings, carried out by Palestinians against Israeli armed forces were on the rise in the occupied Palestinian territory. At the time Israel launched a crackdown on alleged “online incitement” by Palestinians. Yoav Haifawi writing for Mondoweiss last week pointed out that even in its indictment against Tatour, the prosecution made a point to stress that during the period of Tatour’s post “many attacks were carried out against Israeli Jewish citizens”. 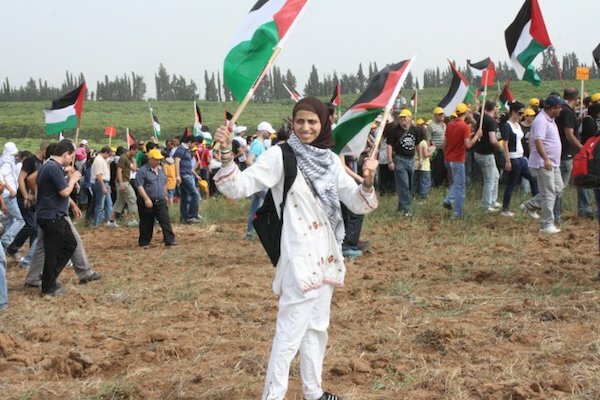 Tatour, her defense team, and supporters have argued that Israeli authorities grossly and intentionally misinterpreted her poem as a call for violence against the state, something Tatour has vehemently denied. “The goal is to arrive at a state that includes everyone, based on the principles of justice and equality, without any concessions of our rights as Palestinian people living in the homeland in which we were born,” she said. Following Tatour’s conviction, her lawyer Gaby Lasky, who also represents 17-year-old Ahed Tamimi, said she planned on filing an appeal. “How weak is Israeli democracy that today the court in Nazareth decided to convict the young poet Dareen Tatour for a poem she wrote. We will appeal to a decision after a sentence has been handed down,” Lasky posted on Twitter last May. Haaretz reported in April 2017 that Israeli forces detained at least 400 Palestinians in less than a year over social media activity, and that 400 others were detained for the same reason by the Palestinian Authority through its policy of security coordination with Israel. In contrast, the Arab Center for Social Media Advancement 7amleh documented in 2017 that slanderous, provocative, and threatening posts made by Israelis against Arabs and Palestinians more than doubled in 2016, reaching 675,000 posts made by 60,000 Hebrew-speaking Facebook users—without a single case being opened against an Israeli. Comes in the context of systematic attacks on Palestinian freedom of expression online by the Israeli government. “The Israeli government has arrested hundreds of Palestinians in the past years, with the aim of intimidation and allegedly prevent any act of resistance to the policies of the illegal occupation and to prevent freedom of speech regarding the occupation, both in the West Bank, Jerusalem and Israel,” the group said.